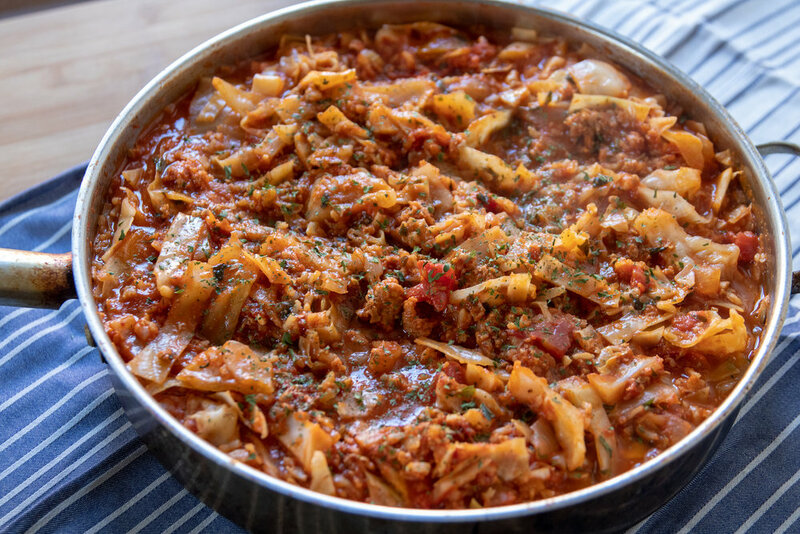 Cabbage rolls are one of my favorite comfort meals, however they are not quick. That’s why I love this recipe for “unstuffed” cabbage rolls. It’s so much faster, and just as delicious, and comforting. This recipe makes a lot and freezes well, so it’s also perfect for meal prep, or even a pot luck. In a large, deep skillet, heat a few teaspoons of oil medium heat. Add diced onion, and meatless crumbles, or Beyond Burgers to the pan. Cook until the crumbles have cooked through. Next, add the cabbage, and water. Allow the cabbage to cook for about 5 minutes, just long enough for it to cook down a bit. Add the remaining ingredients, and give every thing a good stir. Once it begins to come to a simmer, reduce heat to low, and cover with a lid. Allow to cook for 30-35 minutes, stirring occassinsaly to keep anything from sticking to the bottom of the pan. Serve garnished with some fresh, or dried parsley. This recipe will serve 6 - 8 people. If you are single, or a small family, you can easily freeze any leftovers portioned in freezer bags. I often freeze half for a quick week night dinner. Just leave out to thaw, and reheat in a pan on the stove top.